On Monday, April 8 at 6 p.m., Health in Balance will host its “7 Steps to Relieve Neck & Back Pain” workshop. Dinner will be provided and the interactive workshop is free. Dr. Gary Arthur, DC ND will share his wisdom and expertise from 30 years of practice helping heal and restore thousands of people with these same challenges. At the workshop, you will learn: What you can do for 10 minutes each day to improve neck and back health, and prevent injury and degeneration; The secrets to postural restoration and why it is so important; What to never do after injuries if you want to maintain a healthy body; The top foods you can eat to decrease your proclivity to pain; and why your symptoms aren’t going away easily and what can be done about it. To RSVP, call (949) 497-2553 or visit www.healthinbalance.com/events. Health in Balance is located at 380 Glenneyre, Suite G.
On April 14, from 9 - 10:30 a.m., LOCA invites the public to take part in a Watercolors on the Beach class at Treasure Island Park. Tour the tide pools and learn about ocean conservation, then learn to paint tide pool creatures in a watercolor journal with September McGee. On Monday, March 25, Miracles for Kids, an OC-based nonprofit organization that supports families with critically-ill children who are struggling financially and emotionally, hosted the 2019 Miracles for Kids Golf Invitational Presented by Perricone Farms at the exclusive Santa Ana Country Club Course. David August Heil lives in Laguna Beach and is on the Board of Directors for Miracles for Kids. He is heavily involved in the organization and donated four custom sports jackets to the winning team at the Golf Invitational. In just its second year running, the Golf Invitational raised over $185,000 in support of Miracles for Kids’ critically ill children and families in need and welcomed 150+ attendees – including both new and returning sponsors and players. Monday’s Golf Invitational was hosted by Miracles for Kids with presenting sponsor Perricone Farms Premium Juices. Joe Perricone, Chairman of Perricone Farms, has shown incredible support for the organization and was named the Miracle Maker Honoree at the 2018 Night of Miracles Gala: The Miracle of Magic. Bob Rovzar, CEO & Partner, who serves on the Board of Directors of Miracles for Kids, also heads the Southern California-based company. Perricone Farms sponsored a beautiful on-course comfort station with fresh juices and healthy snacks for the golfers. The day kicked off with a breakfast sponsored by PrimaHealth Credit and signature drinks hosted by Nolet’s Silver Gin, Ketel One, and Perricone Farms Premium Juices – during which time players were able to warm up at the Chipping Clinic with Majesty Golf pros. At shotgun, golfers raced out to play on Golfweek’s #1 rated course designed by Jay Blasi with each hole featuring a different activity and/or food and beverage option for players to enjoy. Some notable favorites were the Perricone Farms Comfort Station at Hole 4 that also featured the $5k Hole-in-One contest, a flatbread and whiskey tasting station at Hole 1 hosted by Malibu Farm and Faherty Brand from Lido Village, and custom branded golf-themed cake pops featuring Miracles for Kids and lead sponsor logos handmade by Albert’s Petite Sweets at Hole 16. The Golf Invitational provided various other creative ways for participants to give back through a number of lively contests and chance-to-win opportunities, including a $1 million shootout, a $5,000 putting contest, a Pebble Beach Hole-in-One, an Audi Q5 Hole-in-One sponsored by Audi Mission Viejo, a $10,000 Exclusive 1-day Pebble Beach Golf Trip for 4 on a Lear XR40 Jet, an Opportunity Item donated by Jim & Glenys Slavik and family, a ball drop, and a mega putt contest, to name a few. After a good day on the course, players returned to a hosted Cocktail Reception sponsored by Wells Fargo Advisors. During this time, the always-meaningful Fund-a-Need portion of the reception brought in an impressive $71,000 in pure donations to benefit patient families throughout California. The day concluded with the Championship Awards sponsored by luxury menswear brand David August, announcing Hospitality 88 as this year’s winning team. Team players Ryan Gale, Richard Ham, Dai Phung, and Bronson Wright will all receive highly coveted custom sports jackets from David August. Miracles for Kids is a 501(c)(3) nonprofit serving children with life-threatening illnesses and the families that care for them. By operating programs that provide financial aid, basic needs, and wellness to patients and their families, Miracles for Kids creates stability when families are crumbling from the financial and emotional devastation of fighting for their child’s life. Founded in 2002, Miracles for Kids is based in Tustin. For more information, visit https://miraclesforkids.org/. For thousands of years, sound has been used by several cultures as a tool for healing. Sound healing helps facilitate shifts in our brainwave state to allow internal healing to occur. On Sunday, April 7 at 10:30 a.m., Stacy Pendleton will be sharing the benefits and origins of sound healing with the members and friends of the Unitarian Universalist Fellowship of Laguna Beach. Since the benefits of this modality can only be fully enjoyed and understood experientially, Stacy will share sound healing with those in attendance by chanting in Sanskrit, toning, and playing singing bowls – a guided meditation interwoven throughout the experience. Singing bowl therapy, for example, dates to the 12th century and has been used for meditation and rituals in Tibetan culture. A 2016 study found that singing bowl meditation reduced stress, anger, depression, and fatigue. All these things are known to impact physical health and reduce the risk for disease, suggesting that singing bowl therapy may be good for your physical, as well as emotional, well-being. Don’t miss this unique opportunity for learning and healing. I’m confused. Is this a straitjacket or a harness? Keep your little ones active this spring with classes offered through the City of Laguna Beach Community Services. These activities are great for helping your kids learn new skills as they grow. Kids dance classes being offered include: Ballet, Tap, Jazz, Hip-hop, Lyrical, and High School Dance Prep. Fundamentals are taught with songs and fun games to encourage development in rhythm, balance, coordination, social skills and more. Students will learn dance etiquette in a structured and supportive environment. Classes are held in the Laguna Beach Community Center. The Skyhawks basketball program is a fun, skill-intensive program that is designed to focus on fundamental skills such as passing, shooting, and dribbling. Boys and girls will also learn vital life lessons such as respect, teamwork, and responsibility. The Swim Team Prep classes offer practice in dives and various swim strokes in the twice-weekly sessions. Bring goggles and caps. Participants must be able to swim across the pool on their own. A work in progress – the new mural at Sawdust Art Festival – Cliff Wassmann’s design was approved by the Arts Commission one month before the “super bloom” mania started. Talk about good instincts. 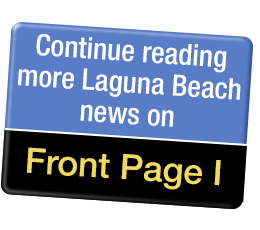 The Laguna Beach Police Department reported this week that the number of crimes committed in town in 2018 was the lowest on record. Chief Laura Farinella’s second biennial report shows a seven percent drop in crimes against people from 2016 to 2018 and a 32 percent drop in crimes against property for the same period. Murder since 2012 has been the least committed crime in Laguna: zero. Arson and assaults went up in 2018, but robbery, larceny, burglaries and vehicle theft all declined. “I am proud to lead the men and women of the Laguna Beach Police Department who are compassionate, forward thinking, and committed to providing the highest level of law enforcement services possible,” wrote Farinella in her second biennial report since she was appointed Laguna’s chief of police in 2015. The report includes crime statistics from 2014 to 2018, information about the officers, divisions in the department, services provided and the message from the chief, highlighting accomplishments, changes and improvements in the department since 2016. Improvements include a data-driven approach to identifying crime and nuisance-related issues, monthly meetings of sergeants, supervisors and command staff to discuss the best way to address those issues and the best way to include the community. “This data driven approach has efficiently and effectively reduced crime,” wrote Farinella. The department has also better used technology, such as the drone program and expanding the citywide camera system, starting to implement body cameras for officers, completing the citywide Hazard Mitigation, Emergency Evacuation and Shelter Plans, all successfully tested during the Aliso Fire in June 2018,” according to the report. Community engagement and outreach programs have enhanced the department’s ability to work in partnership with all of the community, in Farinella’s view. Programs include the 300-strong Community Emergency Response Team, Citizens Academy, Cookies and Coffee with a Cop, Pizza with Police, Special Olympics’ Tip-a-Cop and the department’s first School Resource Officer. The department has 130 employees, including part-time seasonal staff. Of the 98 full-time employees, 54 of them sworn officers – meaning they have graduated from an accredited police academy and are empowered to carry a gun. Ten percent of them are women. Forty-four nonsworn employees include Police Explorers, Citizens on Patrol and Animal Shelter volunteers. Seventy-three percent are women. K-9 Ranger joined the department just months before Farinella in 2015. His job is to sniff out hidden suspects, evidence and narcotics. He also responds to burglary alarms and crimes in progress. The glossy 59-page report was produced by the department, rather than farming it out, Farinella said. Emergency Operations Coordinator Jason Villwock put together the written materials and worked with the divisions to get photographs and statistics. Officer Mike Short created the graphs and charts in the 59-page report, which cost $3,000, funded by Farinella’s supplies budget. “It has been sent to local law enforcement agencies and to agencies similar to ours around the state and it is being copied,” said Farinella. The report can be reviewed page by page on the city’s website at www.lagunabeachcity.net. The mission statement of the Laguna Beach Police Department is to preserve human rights and enhance the quality of life through equitable law enforcement and responsive public service in partnership with the community.